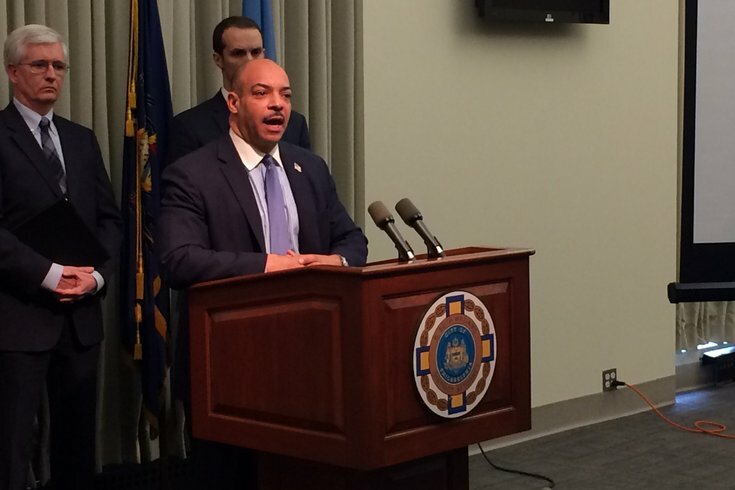 "There is insufficient evidence to prove any individual committed a criminal offense," Seth Williams said. Philadelphia District Attorney Seth Williams announces that there will be no charges brought against former Philadelphia Eagles running back LeSean McCoy - or anyone else - in connection with a fight that occurred in Old City Feb. 7. Philadelphia District Attorney Seth Williams said Monday there will be no charges for former Philadelphia Eagles running back LeSean McCoy – or anyone else, for that matter – following a February brawl in which two off-duty police officers were injured. Saying the investigation into the Feb. 7 brawl at the Recess Lounge in Old City was "like a Pablo Picasso painting," because witnesses had wildly different interpretations of the altercation, Williams said that 44 interviews with 27 people who were at the nightclub that night couldn't produce enough evidence to charge anyone with a crime. • No one at the scene filed a police report that night. • Two victims in the case – both off-duty police officers – gave conflicting accounts. • Everyone involved had been drinking. "There is insufficient evidence to prove that any individual committed a criminal offense," Williams said during an afternoon news conference. John McNesby, president of the Fraternal Order of Police, expressed anger in a statement that the DA's office would not deliver charges. "Apparently, assaults recorded on video are prosecuted everywhere, except in Philadelphia, particularly when the victims are police officers," McNesby wrote. Williams said there wasn't clear evidence to prove that the brawl – especially McCoy's alleged role in the fight that was captured on amateur video – wasn't a result of self defense. One of the officers suffered a broken nose and broken ribs, while the second officer received eight stitches over his left eye and was treated for a possible skull fracture. "Only two individuals gave any information about how anything physical was initiated," said Williams, pointing to the two officers' accounts. "They had completely inconsistent accounts of how this fight started." In fact, the district attorney went as far as calling the officers' accounts "directly in opposition" to each other. What Williams did know was that, on the evening of the incident, at some point two groups – McCoy's group and another that included the off-duty officers – butted heads at Recess Lounge, at 125 S. 2nd Street, after one individual took a bottle of Champagne that belonged to someone else. As a result of that possible misunderstanding, Williams said, someone – not McCoy – grabbed that individual by the throat and a fight between the two groups erupted. "This all started over people thinking someone had taken their bottle of champagne," said Williams, who talked about the events that night in general terms. With no clear indication of how the fight started, Williams said, the video posted online didn't provide much help in the way of determining fault. He said that while investigators viewed cellphone videos of the incident, shot by witnesses at the scene, and footage from an outdoor surveillance camera, there was no surveillance video available from inside the club to provide evidence of the events leading up to the fight. None of those who shot cellphone video came to police with unedited footage for investigators to review, Williams added. Even then, Mike Barry, deputy district attorney of the pre-trial division in the DA's office, said that eyewitness video likely wouldn't have caught the initial blows, because "people only look when there's something to see." Also, Williams said it didn't help investigators when, after the fight, no one immediately filed a police report or accepted medical help from police officers outside the club that night. "All of the participants said no," said Williams. Instead, the off-duty officers took themselves to area hospitals to have their wounds treated and there was no report of the incident made to the police until at least 12 hours later. Everyone involved in the fight, Williams pointed out, was drinking that night. That led to Williams' comment that eyewitnesses accounts were like a "Pablo Picasso painting" with many different views of the same incident. "It was our job to put that together," he said. Asked if there would be any charges against the off-duty Philadelphia officers who were reportedly armed while drinking at the club - in violation of department policy – Williams said there was no evidence to show fight participants had a gun.